A stock aircraft called Basic Jet. Built with 24 of the finest parts, its root part is Mark1Cockpit. A basic jet plane built entirely from parts that come with the first Aviation unlock in career mode. 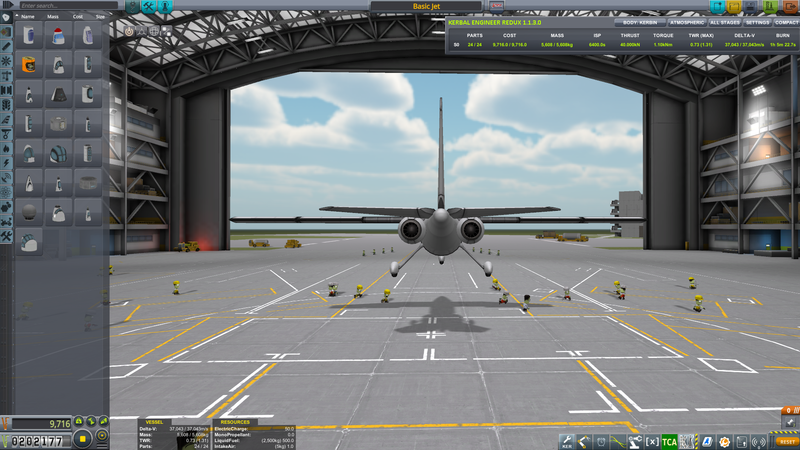 When I first unlocked Aviation I was trying hard to build a working plane with the provided parts. I failed. I knew little about CoM, CoL, how to influence those, and where the landing gears should be. The plane wouldn’t lift off, it would run off to the side on launch or when wheel-braking, have bouncy landings, and the most frustrating thing: the fixed landing gear kept exploding. Later, as my designing experience (and piloting skills) increased, I went back to the drawing board and tried again. This plane weighs just over 5 ½ tons, so it is light enough for the dreaded fixed langing gear to be able to carry it. It lifts off and can land at 55m/s, even slower than that when the flaps are deployed (RCS key), so this also helps with exploding gears. The fixed landing gear has the spring strength reduced and dampers increased, so they can handle more impact on rough landings. Also the brakes are set to maximum. The nose wheel’s friction is reduced to help against the plane running off to the side on launch and braking. This also prevents hefty reactions to wheel steering inputs. The rear landing gears are positioned slightly behind the center of mass, so it’s easy to pull up the nose for takeoff, and also enables soft touchdowns with a flare angle. The tail is angled upwards to provide ground clearance during takeoff and landing. The high position of the wings give it a stable attitude, so it’s easy to fly. The control surfaces have their authority decreased to make steering less sensitive. Notice the yellow and the green curve in the Static stability analysis window (CorrectCoL mod) are almost identical. That means the flight characteristics don’t change much with fuel consumption, because the center of mass doesn’t move much. 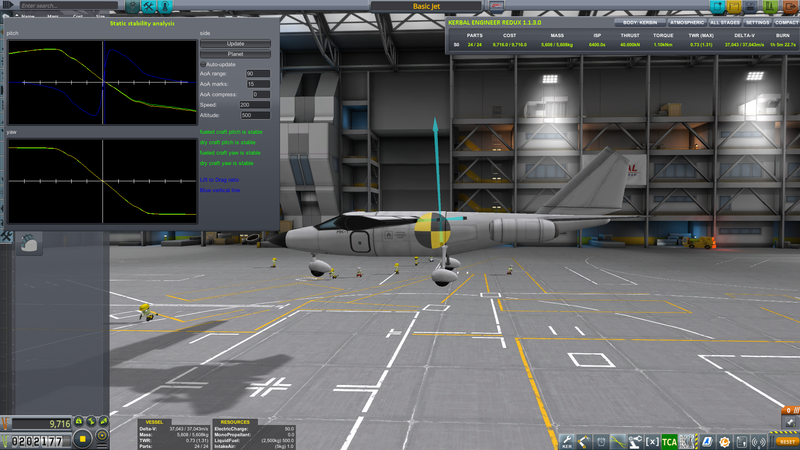 The two jet engines have enough power to give it a surprising max speed. 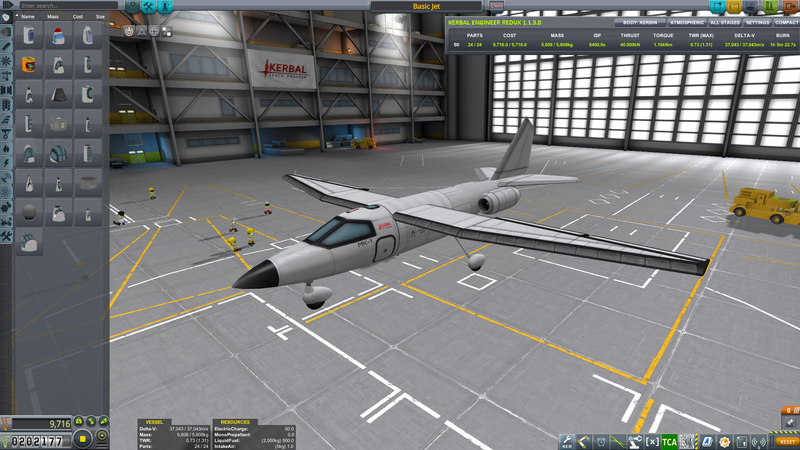 This is also due to the fact that it only needs a very low angle of attack (1.9 degrees) for a level flight. 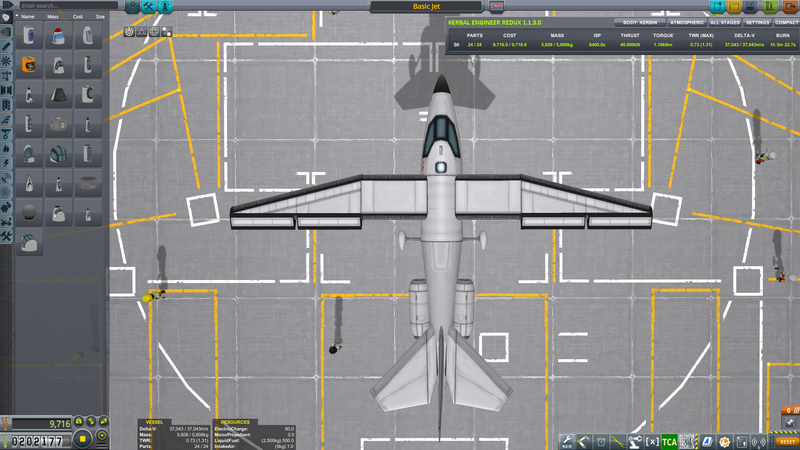 The engines are positioned so that the thrust vector goes through the center of mass. The center of lift is slightly behind the center of mass.